​This image of my friends 2 White Boxers Silas & Sprout, was captured by myself on one of my many visits to theirs with my camera. Sprout was only a baby at the time and I thought this image summed up the loving nature of a Boxer dog that I knew would be turned into a piece of Art at some point. I chose this image because it fit perfectly to the shape of the angled heart. 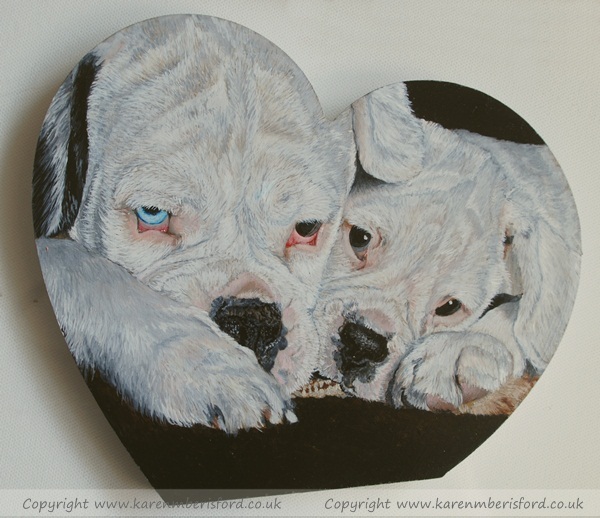 The heart is first treated with 2 applications of GOLDEN Acrylics Matte Medium which dries as a transparent layer, I use the natural colour of the MDF as an important base tone for the first layers of tonal placement and application. After applying the outline, I then apply the base tones. The first layers takes the longest with upto 8 hours work on this double portrait which is where I fill in all the underlayers or the base tones - these are the dark shades of greys and pinks that are very important for the second layers which are the addition of the fine details that follow. The second layers are the final layers where I build up the fine details to create the final portrait, layering can sometimes create brush stroke peaks which add to the effect of fur. The edges of the heart have been painted with Silver paint and the back will be painted black and Silas & Sprout's names was painted on the back of the portrait. Once the portrait was completed, I applied 2 layers of GOLDEN polymer Satin Varnish with UVLS which provides additional protection from UV light. The final portrait was completed as freestanding so the recipient could choose how they wished to display it. Large hearts are quite heavy andif freestanding is preferred, it needs to be safely stood somewhere with it's back to a solid wall or placed on a stand - it can also be framed in a box frame but it is best to have it framed by a competent framer to ensure the portrait is fixed safely and securely within it's frame.